After a couple of diversions, we return to a beer from the Saint Arnold Brewing Company. My initial plan was to review around five of Saint Arnold's offerings in a row to give a nice (uninterrupted) profile of the brewery. Well, life has a funny way of getting in the way sometimes, but we're back on track (for now). Next up, we have another of the brewery's seasonal offerings, Spring Bock. Compared to its fellow bottom-fermenters, the bock style of lager is strong and requires a few more weeks of lagering (cold storage). It originated in medieval Germany as a beer to celebrate Spring and mark the end of the brewing season. In German, bock means billy-goat, explaining why so many bock labels (although not this particular one) prominently feature goats. "By law in Germany, to call a beer a bock it must be brewed to a high starting gravity and thus to a high alcohol content. Our beer follows these guidelines. There are many beers in the United States that use the term "bock" for their beers which aren't really bocks. They may be perfectly good beers, but they're not bocks. They are just dark colored light bodied American lagers." Ouch. They do have a point though, Shiner Bock weighs in at a paltry 4.4% ABV, while Spring Bock has a decisive advantage at 6.4% ABV. Let's see if the beer lives up to the smack-talk. Verdict: Spring Bock is a well-balanced dark lager with rich malt and crisp citrus hiding above-average potency. 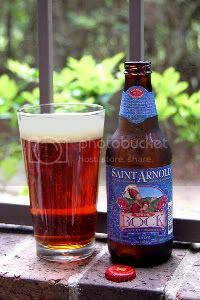 With this beer Saint Arnold is really forcing me to rethink my standards for a good bock, and I love them for it. I saw this at the grocery store and picked it up. Pretty good stuff. The alcohol finish offsets the malt flavors nicely.